Made with just 7 ingredients, No-Bake Fruit & Nut Granola Bars are quick to make, budget-friendly and great for lunch boxing & afternoon snacking. This post was made possible by our friends at Made In Nature! 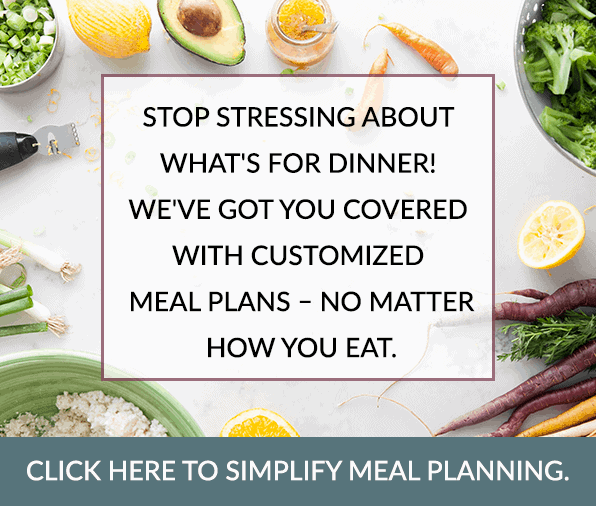 Healthy snacking made simple and delicious! 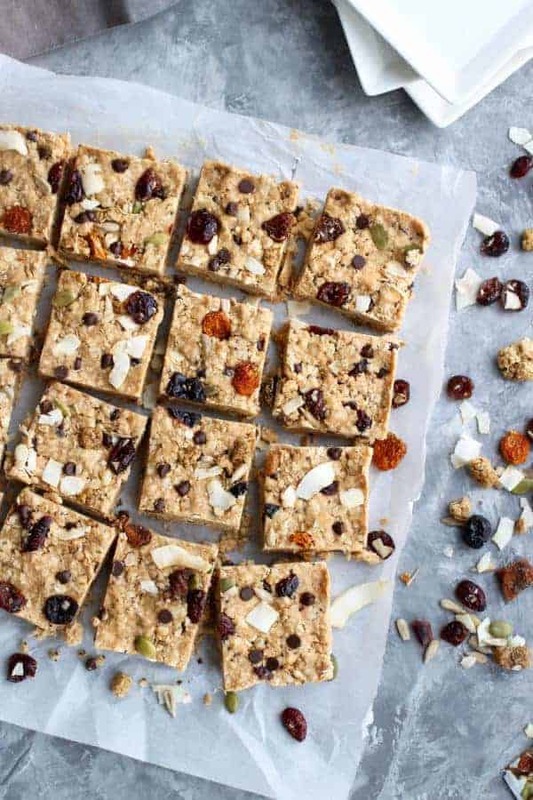 No-Bake Fruit & Nut Granola Bars are prepared in less than 10 minutes and made all in one bowl. 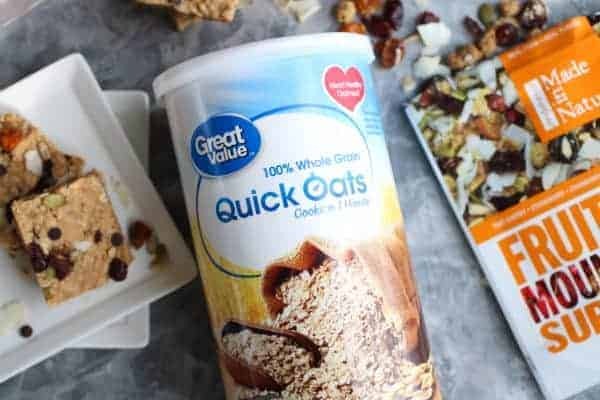 Thanks to the quick oats, there is no food-processing needed making that one less dirty dish you’ll have to wash…a win in my book! 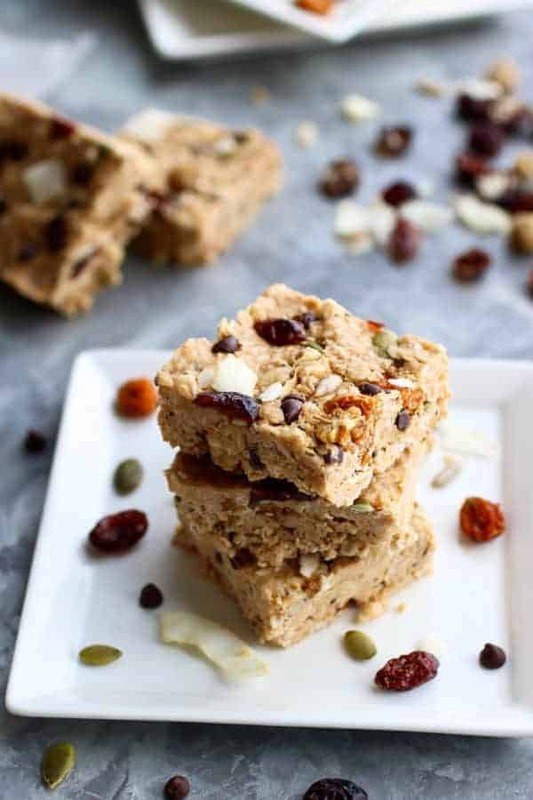 You’re going to love the simple combination of your favorite nut butter, quick oats, the added crunch from crisp rice (aka: Rice Crispies) cereal, the touch of sweetness from the honey, the flavors from the Made In Nature dried fruit, the nuts as well as the chocolate chips and a dash of cinnamon if you wish. And what’s better than knowing exactly what’s going into your food? When you purchase a box of granola bars, not only is it more expensive (we’ll get to that topic in sec.) but the ingredient list can get pretty lengthy, full of uncertain ingredients and added processed sugar is almost always a given. 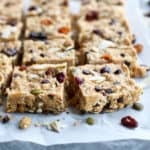 Additionally, making homemade granola bars is super easy, it’s fun, it’s versatile and it’s the perfect recipe to get kids involved in the kitchen. Made In Nature snacks are available at Wal-Mart! That’s right, you know we love our Made In Nature dried fruits & snacks and now they are available nationwide at Wal-Mart stores. Right, smack dab in the middle of the produce section! How convenient. Made In Nature does not “mess around with food. Nature got it right the first time, and they’ve got mad respect for that”. 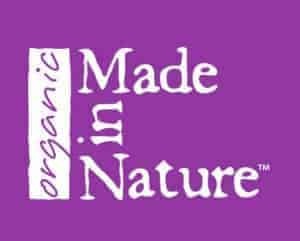 We love that about Made In Nature and also that they’re products are USDA Certified Organic, Non-GMO Project Verified, made with no sulfurs, additives or preservatives, and allergy & vegan friendly. 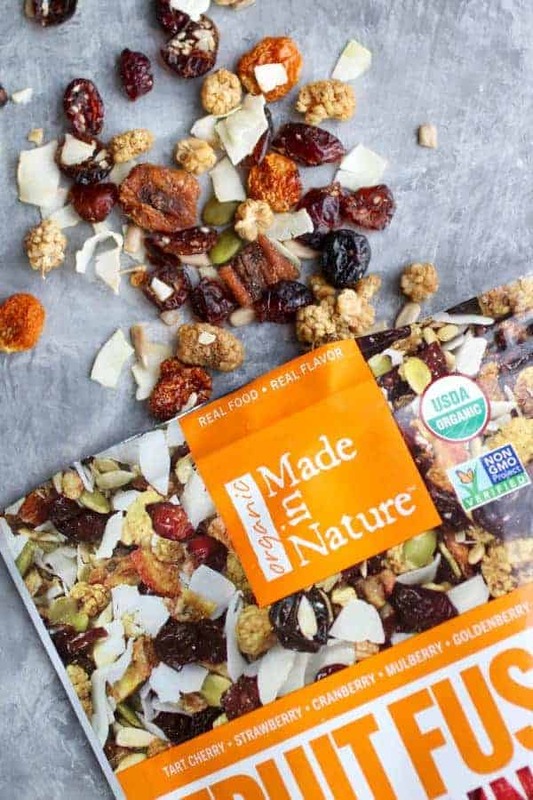 So hit up your local Wal-Mart and grab yourself a bag of Made In Nature dried fruits or snacks. The Nutter & Jelly Nut Butter Figgy Pops are my personal favorite. In fact, they were even featured in our exclusive newsletter that we send out once a month to our subscribers. In that newsletter we include 5 things we’re loving lately. If you’re conscious of your spending like Jess and I are, or maybe you have a grocery budget you try to stick to, another perk of making your own granola bars is that it’s incredibly budget-friendly. And with Wal-Mart having such great prices and now offering a number of Organic food options, it results to even a greater savings! Lets compare purchasing a box of granola bars with making your own….. The cost of a box of 6 organic granola bars is $3.29. That’s $.54/bar. All items purchased at Wal-Mart. 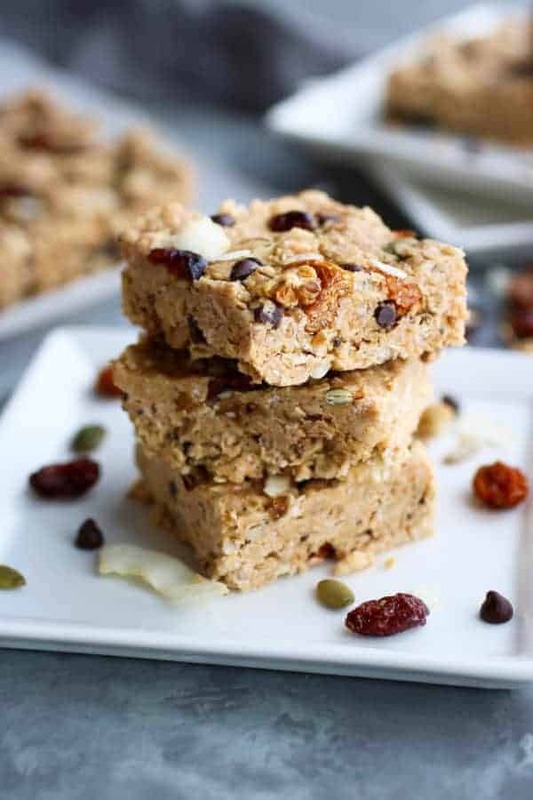 By making your own granola bars, you reduce the cost by 46%. I’d say that’s worth 10 minutes of your time. 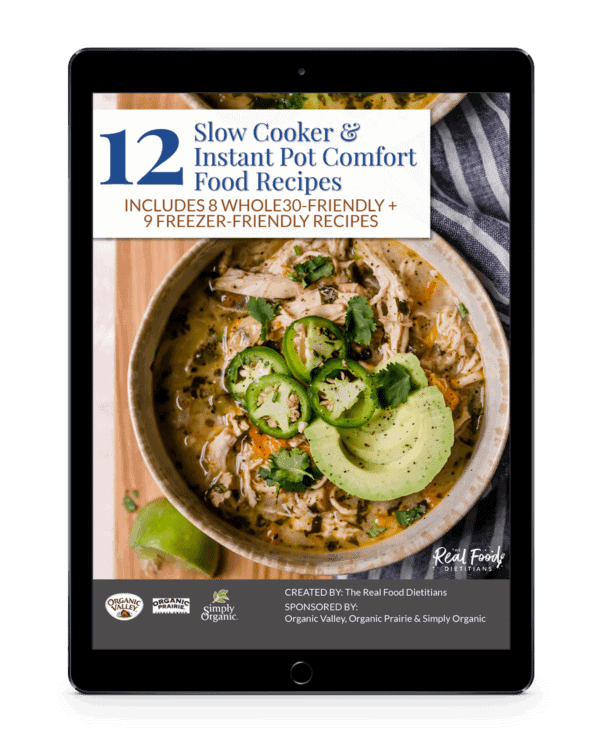 If you liked how we broke down the cost of the recipe and compared it the store-purchased version, please let us know in the comments below and we’ll do our best to continue to share this kind of information. 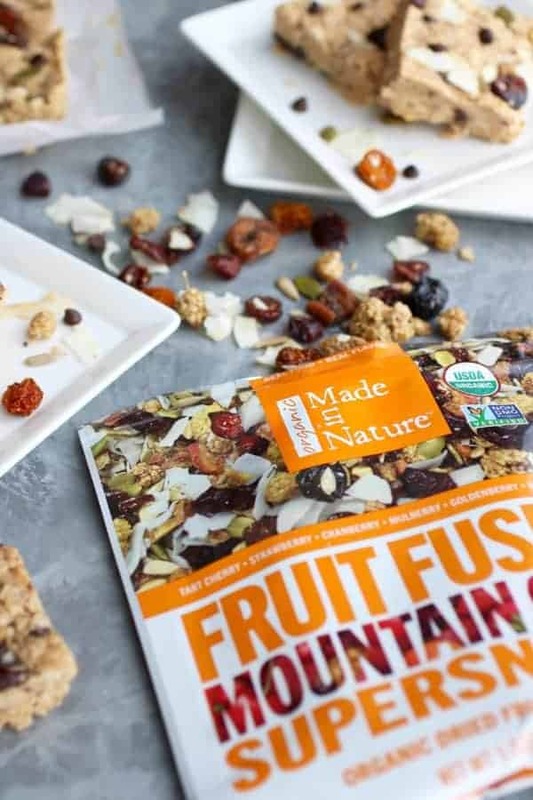 Like our Trail Mix Energy Bites, No-Bake Fruit & Nut Granola Bars are very versatile in that you can mix-and match your favorite ingredients or use what you have on hand. For instance you can use whatever nut butter you like (I’ve made them with both peanut butter and cashew butter), you can change up the dried fruit and nuts, and you can make them nut-free by using sunflower seed butter and a combination of Made In Nature Dried Fruit and seeds of your choice. So without further ado, it’s time to give these No-Bake Fruit & Nut Granola Bars a try. Pro tip: when pressing the dough into the pan, you want to be sure you really put some muscle into it and press it down very firmly. This will help the bars to really hold together nicely. 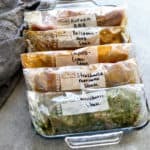 I also recommend that you store them in the fridge as this will also help them stick together. 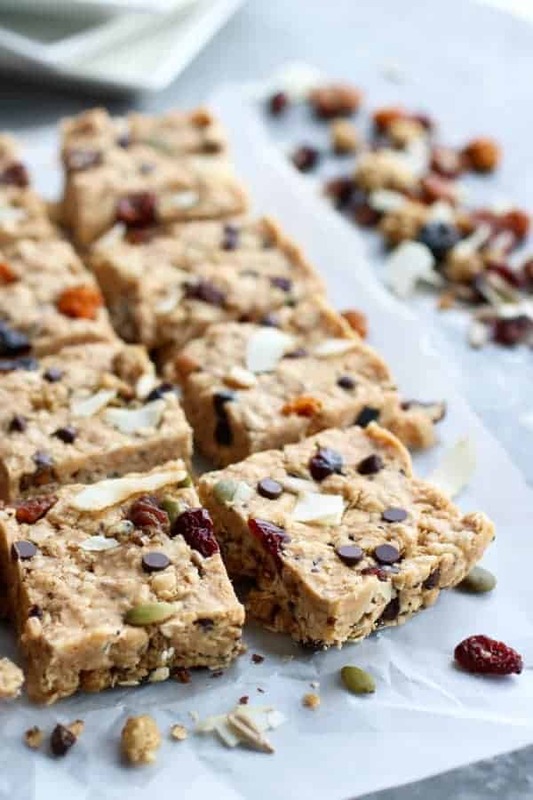 Made with just 7 ingredients, No-Bake Fruit & Nut Granola Bars are quick to make, budget-friendly and great for lunch boxing & afternoon snacking. 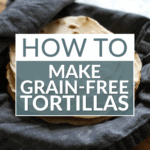 A gluten-free recipe that’s prepared in less than 10 minutes. For a nut-free version, use sunflower seed butter and do not add any nuts. Line a 9 x 9 square baking pan with parchment paper. Set aside. In a medium bowl, combine the oats, crisp rice cereal, nut butter, cinnamon and honey. Stir until well combined. If too dry, add 1 tbsp. additional nut butter at a time. If too wet, add 2 Tbsp. quick oats at a time. Fold in dried fruit, nut/seeds, mini chocolate chips and chia seeds. Once combined, transfer to the 9 x 9 inches square pan. With hands, press very firmly into the pan. If dough is sticking to hands, brush or spray hands with oil. Place in the refrigerator and allow to chill for 30 minutes before cutting into squares. Thank you for the cost breakdown. If I can see the savings I am more likely to follow through on the recipe. Love the break down but it’s frustrating when you also have to make sure products are gluten free. Standard oats and rice crispies are not. I have to pay almost double for those at specialty stores. We totally agree. 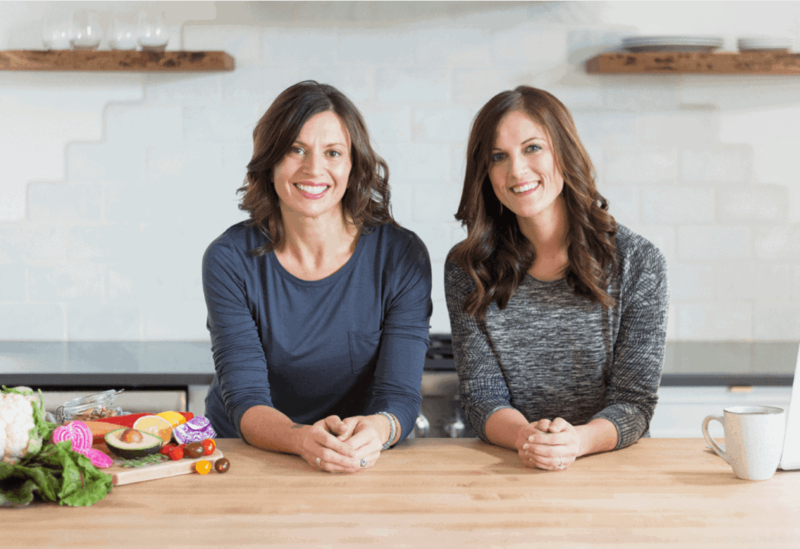 It can be hard to find products that are certified gluten-free and affordable which is why we often recommend sourcing them from places like Thrive Market (affiliate link) where they’re 20-50% less than retail. I kept it simple with just dried cranberries, but I LOVED that I could mix this all in one bowl. 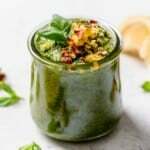 No need to pull out the food processor! Win! Thanks so much Adriana!! ???? Did everything I could have done, but I cannot make the bars. they crumble. However since I live to far from a Walmart , I shopped for ingredients at the local Shoprite. Whats the secret, melting the peanut butter? Maybe then I will get ingredients to stick together to make bars??? Help!!! Hmmmmmmm….I’m not sure what happened. I would suggest adding a little bit more peanut butter and/or honey to the mix until the start sticking together. Also make sure you use quick oats vs. rolled. When you press them into the dish, really press them firmly! Hope that helps. 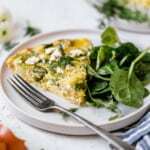 Thanks for featuring a recipe with ingredients available at Walmart! 😍 Walmart, Sam’s Club, my local grocery store, and our seasonal farmer’s market are the places I shop for my groceries. I’m able to get the most organic and natural foods for the best prices by shopping around. I’ll be making these this week for a yummy treat! THANK YOU for a no-bake recipe for these hot summer days! You’re so welcome, Jodi! Enjoy those bars and the rest of your summer!! Can’t wait to make this! How long will it keep for? Awesome! They will keep for 7-10 days in the fridge. Enjoy! 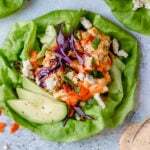 Do you have a vegan newsletter/recipes? I’m planning to have some Boy Scouts make these for a backpacking trip. Since they are teenage boys and they will be using a ton of energy, I’m concerned about the size for these bars. From the picture, they look to be a couple of inches square, but a 9 x 9 pan cut into 16 squares is only about 1/2. Or maybe I am missing something. 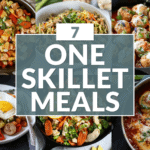 I can make more than 1 pan, just want to make sure I get enough. You may want to double this recipe just to be sure. They are pretty small bites.